Newtec is a satcom solution provider specialised in the design, development and manufacture of equipment, systems and software for satellite communications. Newtec offers the industry's most extensive solutionset across three product lines consisiting of Professional Equipment, Broadband Systems and IP Software solutions. The Company's offerings address many of the latest and fastest growing opportunities of the satellite Broadcast, mobile/terrestrial TV, IP Trunking/Telco and Broadband Access markets. 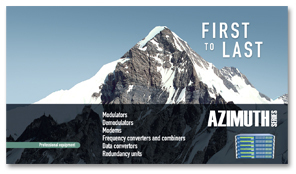 Azimuth is just one of several Newtec solutions that has become an industry standard. This product line consists of stand-alone equipment used for professional digital communication via satellite by customers who require the highest bandwidth efficiency, relyability, flexibility, scalability and a variety of features at a competitve price. The baseline of the familyis a range of advanced DVB-S and DVB-S2 modulation equipment designed specifically for broadcast, telco and Wide Area Network applications. It is completed by a series of generic frequency converters/combiners, redundancy switches and data converters that can be used for any satellite application. 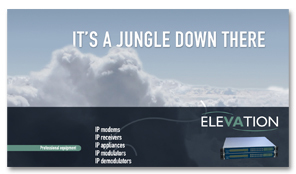 Our Elevation product family is specifically designed to transmit and optimize IP traffic over satellite. It includes modems, receivers, appliances, modulators and demodulators. Elevation truly optimizes the efficiency of applications such as IP trunking, IP backbone, multicast content distribution and private networks. It provides the interfaces to integrate seamlessly with the terrestrial part of the IP network while integrating the most advanced software to encapsulate, route, shape, accelerate and protect the IP traffic. The award winning FlexACM is a capabiltiy on Newtec's Elevation product line that allows simple, yet very efficient implementation of DVB-S2 ACM (Adaptive Coding and Modulation) in IP trunking and IP backbone systems, doubling satellite throughput and customer satisfaction by providing 100% link availability. The Horizon product line offers professional equipment for the market of primary satellite distribution of video and radio content for mobile ans terrestrial TV networks. Such networks typically divided into several hundreds or even thousands of cells, each cell needing its own transmission tower. 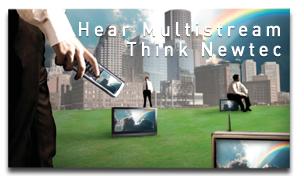 To distribute broadcast content to all those transmission towers, satellite is the perfect solution. The Horizon family consists of a series of equipment to be installed in the transmission towers in order to receive media content from the satellite, process content for local customization of the programs, synchronize the signals with other towers and re-transmit the TV and radio programs terrestrially towards the handheld devices and/or the digital TV receivers.